Here are some of our favourite choices for turning your pergola into a private, flowering space to enjoy some peace and quiet in your backyard. This thorny vine is a fast growing plant that does well in both warm and cool climates. It comes in a range of colours including cream, red, purple, orange, or pink, but is only recommended for pergolas that can hold a lot of weight, as a bougainvillea is an extremely heavy plant. Best grown in warmer, tropical climates, this evergreen plant prefers shadier spots. The dark luscious leaves offer good coverage, but can be a little bit difficult to get established. Officially named Pyracantha, this plant is actually a shrub that can be trained to grow over a pergola. Although it is known to have huge thorns – heavy gloves are recommended when pruning – this evergreen option will attract native birds with its display of brilliantly coloured berries. Although it’s a fairly hardy shrub, the Firethorn is best avoided in frosty, mountainous areas. This climber is best grown in cooler areas and is known for its easy-to-care for nature. Once established, an annual prune is all that’s needed to encourage a summer display of white or pale pink flowers. This plant does well Australia-wide, except for the tropical regions of the country. 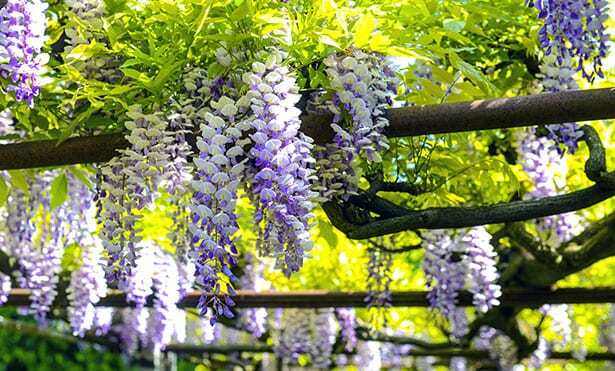 Wisteria flowers come in white, pink, or purple, and are extremely fragrant. 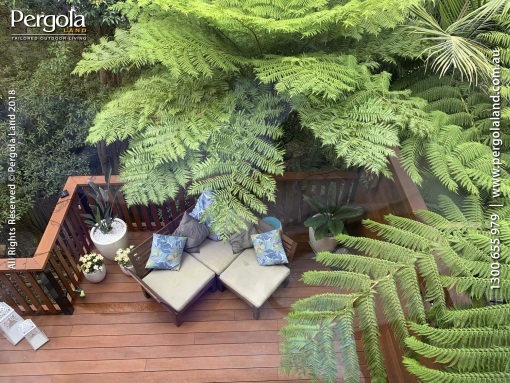 The foliage is luscious enough to block out the harsh summer sun, making a great shady spot to escape the heat. Fast growing and easily trained, Wisteria is a fairly hardy plant but also has a lot of weight to it once matured. This plant’s delicate flower and hardy nature have made it a climber favourite. Although it does take a few years for the Climbing Tea Rose to grow decent coverage, the effects in the long term are well worth the time. With abundant floral displays, this plant does well growing in most areas. Again, this climber is recommended for strong pergolas as it also can bear quite a bit of weight. This fast growing vine is a great option for lightweight pergolas. Easily trained and able to grow anywhere in Australia, the passionflower will captivate all with its exotic flowers over the summer. Although it dies off over the winter, with careful mulching the plant will regrow next season. Otherwise known as a Climbing Potato or Jasmice, this vine will need support as it grows up the pergola, but will reward you with brilliant displays of fragrant white or purple flowers. Similar in appearance to a potato flower, this is another hardy option that is suitable for most regions in Australia. How heavy will the plant be when it matures? How much maintenance is required? Think pruning, training, and mulching. What is the lifespan of the plant? Will it provide the coverage or privacy that I am seeking? If you’re unsure what plant is right for you, seek the advice of a professional who can help you make the most of your pergola and garden.